The Ramayana (Sanskrit: रामायण, Rāmāyaṇa, is an ancient Sanskrit epic. It is ascribed to the Rushi Valmiki and forms an important part of the Hindu smṛti, considered to be itihāsa. The Ramayana is one of the two great epics of India, the other being the Mahabharata. It depicts the duties of relationships, portraying ideal characters like the ideal servant, the ideal brother, the ideal wife and the ideal king. The name Ramayana is a tatpurusha compound of Rāma and ayana ("going, advancing"), translating to "Rama's Journey". The Ramayana consists of 24,000 verses in seven books (kāṇḍas) and 500 cantos (sargas), and tells the story of Lord Shri Rama (an incarnation Lord Vishnu), whose wife Sitaji is abducted by the demon king of Lanka, Ravana. Thematically, the epic explores the tenets of human existence and the concept of dharma. Verses in the Ramayana are written in a 32-syllable meter called anustubh. The epic was an important influence on later Sanskrit poetry and Indian life and culture. Like its epic cousin the Mahābhārata, the Ramayana is not just an ordinary story: it contains the teachings of ancient Hindu sages and presents them in narrative allegory with philosophical and the devotional elements interspersed. The characters Rama, Sita, Lakshmana, Bharata, Hanuman and Ravana are all fundamental to the cultural consciousness of India. There are other versions of the Ramayana, notably Buddhist (Dasaratha Jataka No. 461) and Jain in India, and also Indonesian, Thai, Lao, Burmese and Malay versions of the tale. The poem is traditionally divided into several major kandas or books, that deal chronologically with the major events in the life of Lord Shri Rama—Bala kanda, Ayodhya Kanda, Aranya Kanda, Kishkinda Kanda, Sundara Kanda, Yuddha Kanda, and Uttara Kanda. The Bala Kanda describes the birth of Rama, his childhood and marriage to Sita. The Ayodhya Kanda describes the preparations for Rama's coronation and his exile into the forest. The Aranya Kanda describes the forest life of Rama and the kidnapping of Sitaji by the demon king Ravana. The Kishkinda Kanda describes the meeting of Hanumanji with Lord Shri Rama, the destruction of the vanara king Vali and the coronation of his younger brother Sugriva to the throne of the kingdom of Kishkindha. The Sundara Kanda narrates the heroism of Hanumanji, his flight to Lanka and meeting with Mata Sitaji. The Yuddha Kanda describes the battle between Lord Shri Rama's and Ravana's armies. The Uttara Kanda describes the birth of Lava and Kusha to Sita mata, their coronation to the throne of Ayodhya, and Lord Shri Rama's final departure from the world. Raja Dasharatha was the king of Kosala, the capital of which was the city of Ayodhya. He had three queens: Kausalya, Kaikeyi and Sumithra. He was childless for a long time and, anxious to produce an heir, he performs a fire sacrifice known as Putra-Kameshti Yagya. 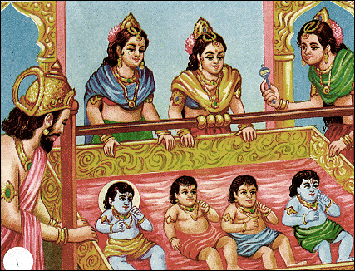 As a consequence, Lord Shri Rama is first born to Kausalya, Bharata is born to Kaikeyi, and Sumitra gives birth to twins named Lakshmana and Shatrughna. These sons are endowed, to various degrees, with the essence of the Bhagwan Shri Vishnu; Shri Vishnu had opted to be born into mortality in order to combat the demon Ravana, who was oppressing the Gods, and who could only be destroyed by a mortal. The boys are reared as the princes of the realm, receiving instructions from the scriptures and in warfare. When Lord Shri Rama is 16 years old, the sage Vishwamitra comes to the court of Dasharatha in search of help against demons, who were disturbing sacrificial rites. 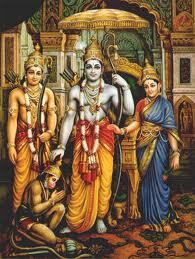 He chooses Lord Shri Rama, who is followed by Lakshmana, his constant companion throughout the story. Lord Shri Rama and Lakshmana receive instructions and supernatural weapons from Vishwamitra, and proceed to destroy the demons. Raja Janaka was the king of Mithila. One day, a female child was found in the field by the king in the deep furrow dug by this plough. Overwhelmed with joy, the king regarded the child as a "miraculous gift of God". The child was named Sita, the Sanskrit word for furrow. Sitaji grew up to be a girl of unparalleled beauty and charm. When Sitaji was of marriageable age, the king decided to have a swayamvara which included a contest. The king was in possession of an immensely heavy bow, presented to him by Lord Shiva: whoever could wield the bow could marry Sitaji. 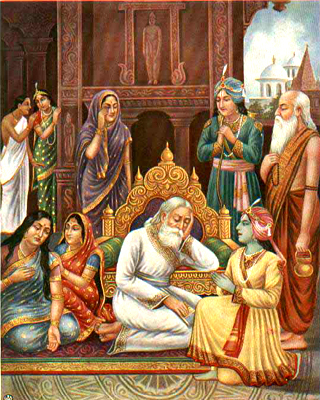 The sage Vishwamitra attends the swayamvara with Lord Shri Rama and Lakshmana. Only Lord Shri Rama wields the bow and breaks it. Marriages are arranged between the sons of Dasharatha and daughters, nieces of Janaka. The weddings are celebrated with great festivity at Mithila and the marriage party returns to Ayodhya. After Lord Shri Rama and mata Sita have been married for twelve years, Raja Dasharatha who had grown old expresses his desire to crown Bhagwan Rama, to which the Kosala assembly and his subjects express their support. On the eve of the great event, Kaikeyi—her jealousy aroused by Manthara, a wicked maidservant—claims two boons that Raja Dasharatha had long ago granted her. Kaikeyi demands Lord Shri Rama to be exiled into wilderness for fourteen years, while the succession passes to her son Bharata. The heartbroken king, constrained by his rigid devotion to his given word, accedes to Kaikeyi's demands. Shri Rama accepts his father's reluctant decree with absolute submission and calm self-control which characterizes him throughout the story. 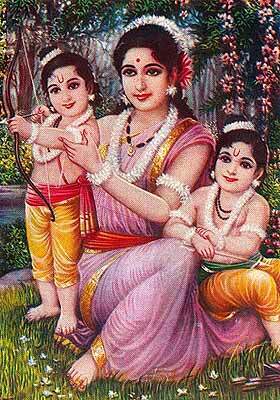 He is joined by Sitaji and Lakshmana. When he asks Sitaji not to follow him, she says, "the forest where you dwell is Ayodhya for me and Ayodhya without you is a veritable hell for me." After Lord Shri Rama's departure, Raja Dasharatha, unable to bear the grief, passes away. Meanwhile, Bharata who was on a visit to his maternal uncle, learns about the events in Ayodhya. 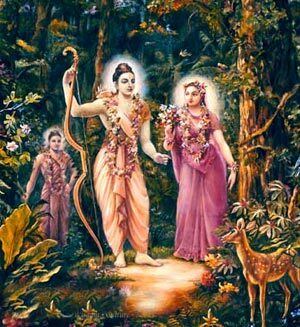 Bharata refuses to profit from his mother's wicked scheming and visits Shri Rama in the forest. He requests Shri Rama to return and rule. But Lord Shri Rama, determined to carry out his father's orders to the letter, refuses to return before the period of exile. 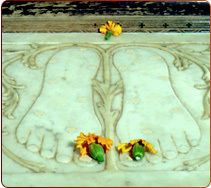 However, Bharata carries Rama's sandals, and keeps them on the throne, while he rules as Rama's regent. Shri Rama, Shri Sitama and Lakshmana journeyed southward along the banks of river Godavari, where they built cottages and lived off the land. At the Panchavati forest they are visited by a rakshasa woman, Surpanakha, the sister of Ravana. She attempts to seduce the brothers and, failing in this, attempts to kill Sitaji. Lakshmana stops her by cutting off her nose and ears. Hearing of this, her demon brother, Khara, organizes an attack against the princes. 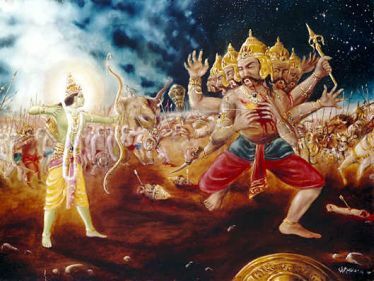 Shri Rama annihilates Khara and his demons. When news of these events reaches Ravana, he resolves to destroy Rama by capturing Sitaji with the aid of the rakshasa Maricha. Maricha, assuming the form of a golden deer, captivates Sitaji's attention. Entranced by the beauty of the deer, Sitaji pleads with Shri Rama to capture it. Shri Rama, aware that this is the play of the demons, is unable to dissuade Sitaji from her desire and chases the deer into the forest, leaving Sita under Lakshmana's guard. After some time Sitaji hears Shri Rama calling out to her; afraid for his life she insists that Lakshmana rush to his aid. 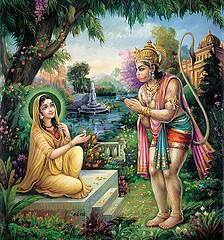 Lakshmana tries to assure her that Lord Shri Rama is invincible, and that it is best if he continues to follow Shri Rama's orders to protect her. On the verge of hysterics Sitaji insists that it is not she but Shri Rama who needs Lakshmana's help. He obeys her wish but stipulates that she is not to leave the cottage or entertain any strangers. Finally with the coast clear, Ravana appears in the guise of an ascetic requesting Sitaji's hospitality. Unaware of the devious plan of her guest, Sitaji is then forcibly carried away by the evil Ravana. 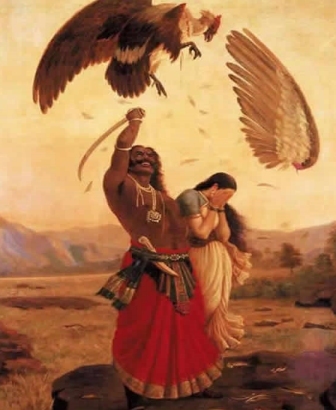 Jatayu, a vulture, tries to rescue Sita, but is mortally wounded. 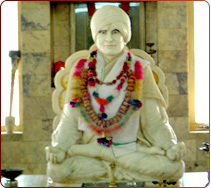 At Lanka, Sitaji is kept under the heavy guard of rakshasis. Ravana demands Sitaji marry him, but Sitaji, eternally devoted to Rama, refuses. Rama and Lakshmana learn about Sitaji's abduction from Jatayu, and immediately set out to save her. During their search, they meet the demon Kabandha and the ascetic Shabari, who direct them towards Sugriva and Hanuman. The Kishkindha Kanda is set in the monkey citadel Kishkindha. 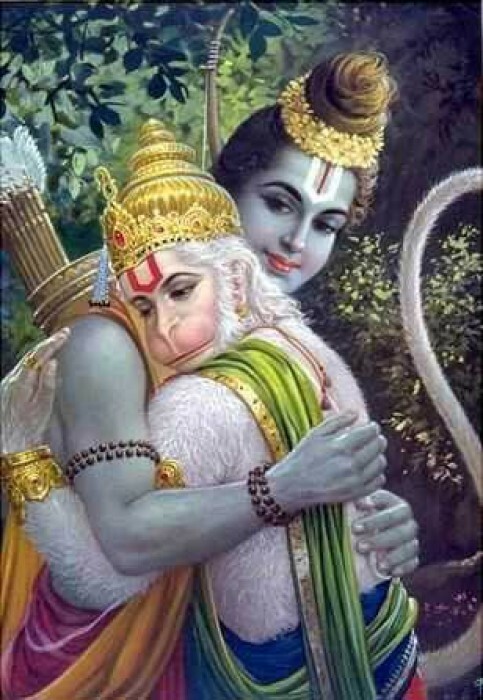 Shri Rama and Lakshmana meet Hanumanji, the greatest of “monkey” heroes and an adherent of Sugriva, the banished pretender to the throne of Kishkindha. Shri Rama befriends Sugriva and helps him by killing his elder brother Vali thus regaining the kingdom of Kiskindha, in exchange for helping Shri Rama to recover Sitaji. However, Sugriva soon forgets his promise and spends his time in debauchery. The clever monkey Queen, Tara, calmly intervenes to prevent an enraged Lakshmana from destroying the monkey citadel. She then eloquently convinces Sugriva to honour his pledge. Sugriva then sends search parties to the four corners of the earth, only to return without success from north, east and west. The southern search party under the leadership of Angad and Hanuman learns from a vulture named Sampati that Sitaji was taken to Lanka. The Sundara Kanda forms the heart of Valmiki's Ramayana and consists of a detailed, vivid account of Hanumanji's adventures. 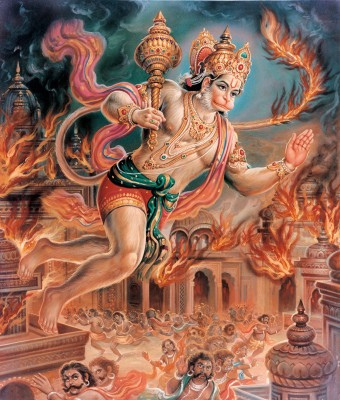 After learning about Sita mata, Hanumanji assumes a gargantuan form and makes a colossal leap across the ocean to Lanka. Here, Hanuman explores the demon's city and spies on Ravana. He locates Sitaji in Ashoka grove, who is wooed and threatened by Ravana and his rakshasis to marry Ravana. He reassures her, giving Shri Rama's signet ring as a sign of good faith. He offers to carry Sitaji back to Rama, however she refuses, reluctant to allow herself to be touched by a male other than her husband. She says that Shri Rama himself must come and avenge the insult of her abduction. 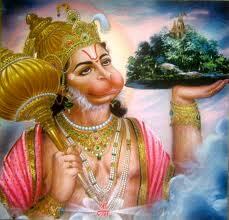 Hanumanji then wreaks havoc in Lanka by destroying trees and buildings, and killing Ravana's warriors. He allows himself to be captured and produced before Ravana. He gives a bold lecture to Ravana to release Sitaji. He is condemned and his tail is set on fire, but he escapes his bonds and, leaping from roof to roof, sets fire to Ravana's citadel and makes the giant leap back from the island. The joyous search party returns to Kishkindha with the news. This book describes the battle between the forces of Lord Shri Rama and Ravana. Having received Hanumanji's report on Sita ma, Rama and Lakshmana proceed with their allies towards the shore of the southern sea. There they are joined by Ravana's renegade brother Vibhishana. 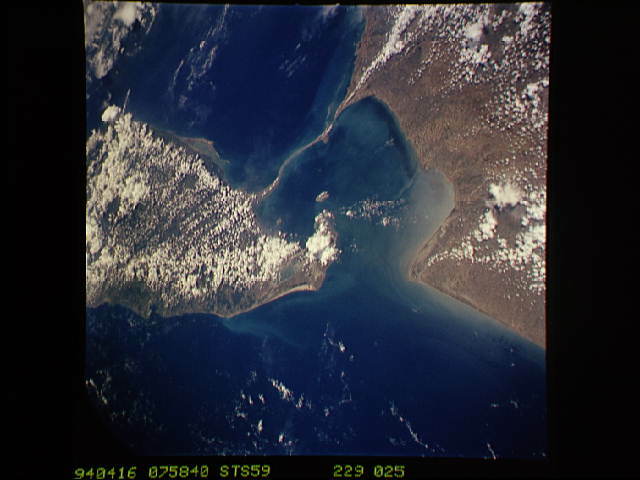 The monkeys named "Nal" and "Neel" construct a floating bridge (known as Rama Setu) across the ocean, and the princes and their army cross over to Lanka. A lengthy battle ensues and Shri Rama kills Ravana. Lord Shri Rama then installs Vibhishana on the throne of Lanka. On meeting Sitaji, Shri Rama asks her to undergo agni Pariksha (test of fire) to prove her purity, since she had stayed at the demon's palace. When Sitaji plunges into the sacrificial fire, Agni the lord of fire raises Sitaji, unharmed, to the throne, attesting to her purity. The episode of agni pariksha varies in the versions of Ramayana by Valmiki and Tulsidas. The above version is from Valmiki Ramayana. In Tulsidas's Ramacharitamanas Sita was under the protection of Agni so it was necessary to bring her out before reuniting with Lord Shri Rama. At the expiration of his term of exile, Shri Rama returns to Ayodhya with Sitaji and Lakshmana, where the coronation is performed. This is the beginning of Ram Rajya, which means an ideal state with good morals. It is a place where all religions, creed and castes can live together in harmony and work towards progress together. Ram Rajya is the ultimate state of a true democracy where through unity one gains strength and protects the other as humanity is the greatest essence above all. Gambling, drinking and hunting were commonly condemned in Ram Rajya. 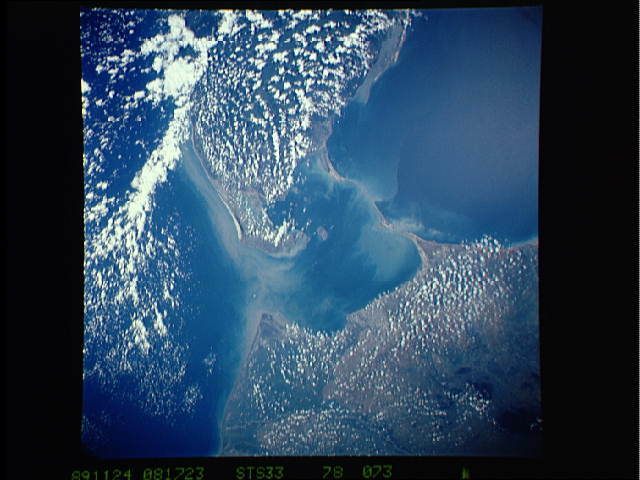 The Uttara Kanda concerns the final years of Lord Shri Rama, Sitaji, and Shri Rama's brothers. After being crowned king, many years passed pleasantly with Sitaji. However, despite the agni pariksha (fire ordeal) of Sitaji, rumors about her purity are spreading among the populace of Ayodhya. Shri Rama yields to public opinion and banishes Sitaji to the forest, where sage Valmiki provides shelter in his ashrama (hermitage). Here she gives birth to twin boys, Lava and Kusha, who became pupils of Valmiki and are brought up in ignorance of their identity. Valmiki composes the Ramayana and teaches Lava and Kusha to sing it. Later, Shri Rama holds a ceremony during Ashwamedha yagna, which the sage Valmiki, with Lava and Kusha, attends. Lava and Kusha sing the Ramayana in the presence of Rama and his vast audience. When Lava and Kusha recite about Sitaji's exile, Shri Rama becomes grievous, and Valmiki produces Sitaji. Sitaji calls upon the Earth, her mother, to receive her and as the ground opens, she vanishes into it. Shri Rama then learns that Lava and Kusha are his children. Later a messenger from the Gods appears and informs Rama that the mission of his incarnation was over. Lord Shri Rama returns to his celestial abode.